Why choose our coffee syrups? More Flavour, More Value. Coffee Syrups are a modern way to flavour brewed coffee with a simple drop. Best of all, for a low price per cup, flavoured coffee syrups offer a premium up-sell. With your own label on our Australian-made syrups, it’s a great chance for brand enhancement. We have learned a lot about coffee flavours that people love, through our association with a number of major coffee retailers. These special coffee syrups are manufactured to a high flavour intensity, and they go well with premium freshly-brewed coffee beans. 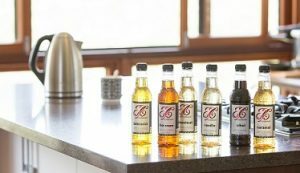 Coffee Syrups are available in our customised high quality 750ml PET bottle, with 6 bottles to a carton and we now also offer a smaller, customised 375ml PET bottle, with 12 bottles to a carton. Want more? We’re open to any new flavour suggestions from wholesale customers. If your coffee brand wants to add a little ‘extra’ brand value, try Own Label Coffee Syrups from The Rainbow Syrup Company – call or contact us by email today to discuss how your company can have an ‘instant’ branded variety of coffee flavours.